MicroRNA biogenesis and function. microRNA coding regions in the human genome are found either intergenic or in the introns of annotated genes. microRNA synthesis starts in the nucleus where most of the miRs are transcribed by RNA polymerase II into primary miR transcripts (pri-miR) of several kilobases that contain local stem-loop structures. The first step of miR maturation is cleavage at the stem of the hairpin structure by a microprocessor complex consisting of Drosha (an RNase III protein) together with its cofactor DiGeorge Syndrome Critical Region 8 (DGCR8), which releases a small hairpin structure of 70 nucleotides that is termed a precursor miR (pre-miR). After nuclear processing, pre-miRs are exported to the cytoplasm by exportin 5 (XPO-5), where they are cleaved near the terminal loop by another RNase enzyme called Dicer, thereby releasing an approximately 22 nucleotide miR duplex. This duplex is loaded onto an AGO protein to generate the microRNA-induced silencing complex (miRISC). One strand (guide strand) remains in the AGO protein as a biologically active miR whereas the other stand (passenger strand, known as miR*) is degraded. The mature miR as part of the effector RISC binds to the 3′UTR region of the mRNA and mediates mRNA degradation, destabilization, or translational inhibition. Apart from this canonical pathway, there is an alternative “mirtron” pathway, independent from Drosha and DGCR8. Mirtrons are miRs that originate from spliced-out introns and are created when small RNAs bind to the termini of small intronic hairpins. Pre-microRNA hairpins with 3′ overhangs are so formed and can mature into 22 nucleotides structures, which look and function as normal miRs. microRNAs exert their repressive function intracellularly, but are also released into the extracellular compartment, with this initiating their role as important intercellular communicators as they are taken up by recipient cells. 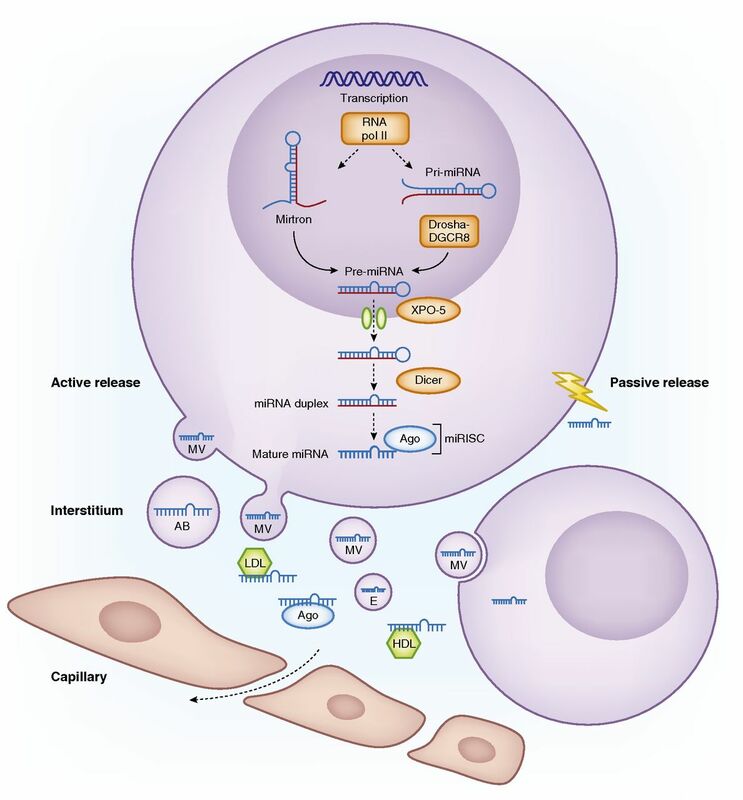 microRNA can be released passively after cell death or injury, or can be actively secreted in different types of extracellular vesicles, including exosomes, microvesicles and apoptotic bodies. Circulating microRNAs form complexes with RNA binding proteins including AGO2 proteins and lipoproteins (HDL and LDL), which protects them from RNAse-dependent degradation. AB, apoptotic body; E, exosome; MV, microvesicle; RNA pol II, RNA polymerase 2. Several microRNAs are involved in the NFκB pathway in AKI. Several microRNA contribute to AKI by targeting the NFκB pathway. 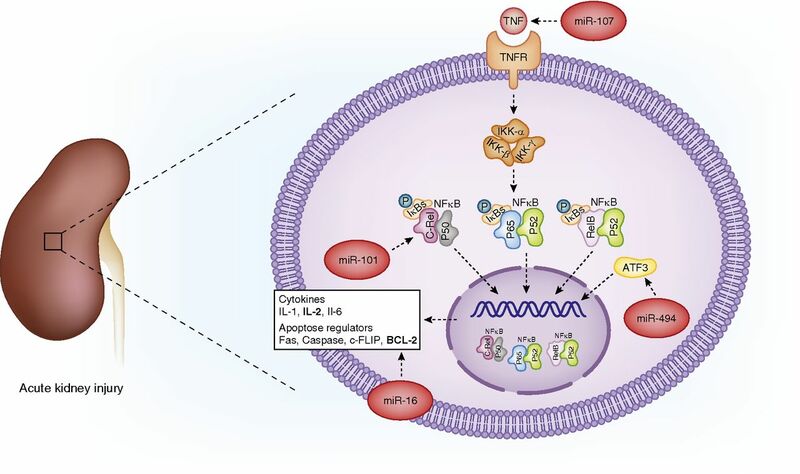 ATF3, activating transcription factor 3; BCL-2, B cell lymphoma-2; c-FLIP, cellular FLICE-like inhibitory protein; c-Rel, P50, P52, P65 and RelB, NF-κB transcription factor family members; Fas, first apoptosis signal; IKK, IκB kinase; TNFR, TNF receptor. Several specific microRNAs are up- or downregulated in the kidney graft in transplantation-related kidney disease. Functional processes are represented in the inner circle, and the outer circle represents molecular pathways of interest for the particular clinical entity. Only the biologically confirmed microRNA–target interactions are highlighted. The color code of the microRNAs indicates whether the tissue microRNA are mimicked in biofluids. Red represents parallel findings in plasma/serum for that particular microRNA. Orange represents parallel findings in urine for that particular microRNA and blue represents parallel findings in PBMC. Combination of the colors is possible. ABMR, antibody-mediated rejection; BCL-2, B cell lymphoma-2; CDKN2, cyclin-dependent kinase inhibitor 2; CXCL8, C-X-X motive chemokine ligand 8; ECM, extracellular matrix; EDN, endothelin; IRI/DGF, ischemia/reperfusion injury and delayed graft function; NFκB/CXCL-8, NFκB/C-X-C motive chemokine ligand 8; TCMR, T cell–mediated rejection; TGFβ/FOXP3, TGFβ/forkhead box P3; TGFβ/SMAD7, TGFβ/SMAD family member 7; VEGF, vascular endothelial growth factor. miR, microRNA; RIPC, remote ischemic preconditioning; AMI, acute myocardial infarction; Scr, serum creatinine; KIM-1, kidney injury molecule-1; AKIN, acute kidney injury network; ICU, intensive care unit; qPCR, quantitative PCR; CS, cardiac surgery. 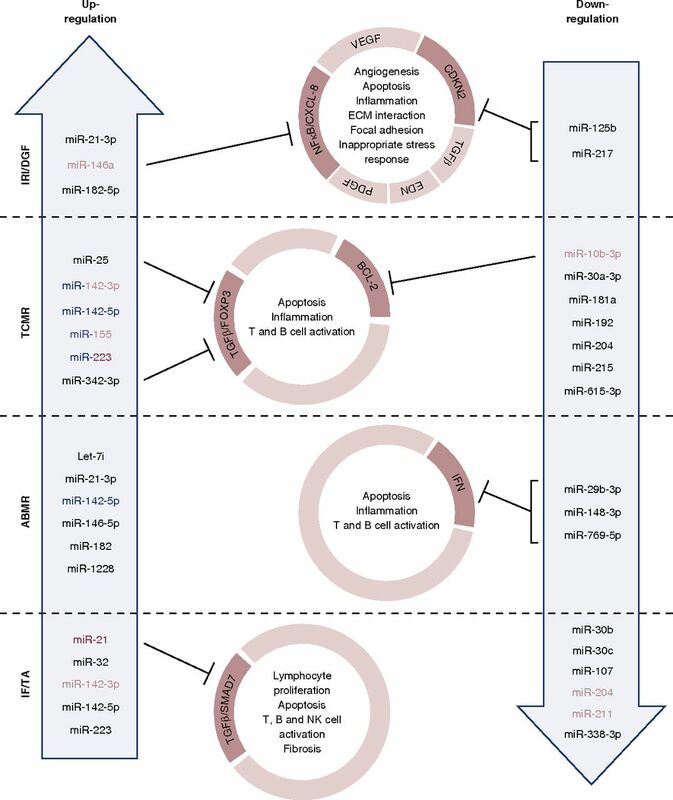 ATN, acute tubular necrosis; PBX, protocol biopsy; Scr, serum creatinine; miR, microRNA; T0BX, time-zero biopsy; RCC, renal cell carcinoma; AR, acute rejection; n.o.s., not otherwise specified; TxBX, transplant biopsy; Tx, transplantation; ABMR, antibody-mediated rejection; APN, acute pyelonephritis; IF/TA, interstitial fibrosis/tubular atrophy; LD, living donor; DD, deceased donor; UTI, urinary tract infection.